Four workers today at Deviation shed, Ian Pearson, James Pearcy, Peter Ellis & Andy Lowes. There were no big job today just lots of little finishing or fact finding tasks, so it was a little frustrating at times but this is what happens with maintenance work. The loco was checked over & small adjustments made ready for the move to the wheel drops hopefully this next week. It looks like the yard had been shunted to leave the way clear to get into the wheel drops. The main job today was to have a look at the gradient pins, bushes & rods. We had some grub screws, tapping drill, taps etc to do the job but when the first hole was drilled we found the bushes in the side rod were hardened. So after a lot of cleaning & polishing of the bush that had come out the pin was eased so it was a good fit. The grub screw idea had to be abandoned! The rest of the sand pipes that were removed last week were cleaned along with the brackets & put into storage above the workshop. 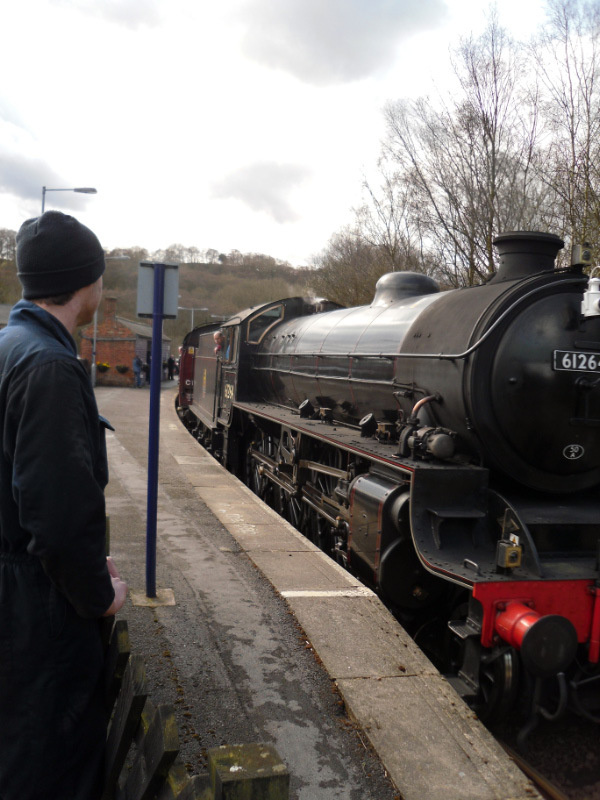 At lunch time some of us went to Grosmont station to see the York to Whitby steam special come through, we also saw it at 17.00 on its way back before we left for home. The dome studs had the nuts & washers put back on to prevent damage or loss. The anti vacuum valve was again worked on, in preparation to remove the super heater header. The sealing plate & the nuts on the flange were removed, to be continued on Wednesday. The stock of axle box lubrication pads was checked on; we found seven that maybe are for the Q6 loco. The underside of the loco has been scraped to remove the thick deposits of crap & some cleaning at the front end was completed. Clean blast pipe studs & assemble spark arrestor base to it. This will save time when we assemble everything in the smoke box if new nuts & bolts etc are all there ready.